This sketch challenge was perfect since I had plenty of kitty cats cut out from where I had done a video explaining how to cut stamped images with the silhouette cameo without pix scan. When I first looked at the sketch image the first thing I saw was a window and wouldn't one of those cats look so cute sitting on it. Started off coloring my cat the following Copics colors G 14, YG 06, G 05, W 7 W 3 and C 1. I glued the front and back of the cat together and set it aside . I chose pattern paper from Me and My Big Ideas boy pack. Lining the MFT window die up in the center of my pattern paper along with the front of my card base and I ran it through my big kick. Choosing Bazzill Atlantis card stock I cut 2 window fames and sills. I also cut a piece of acetate for the window. 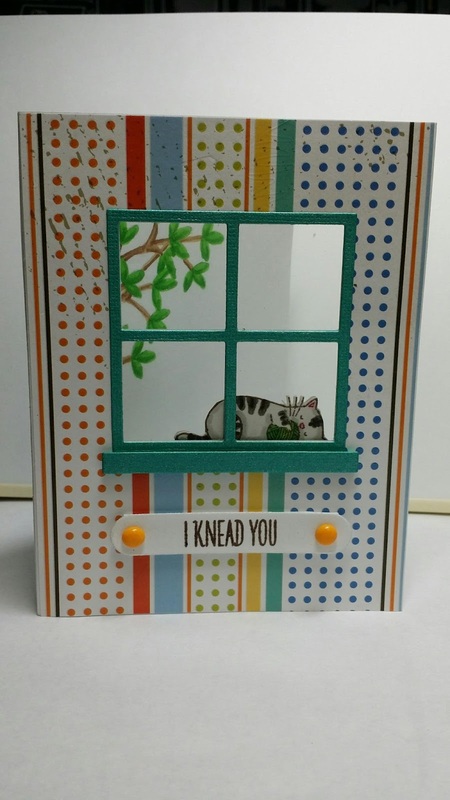 I use liquid glue and put my window together. 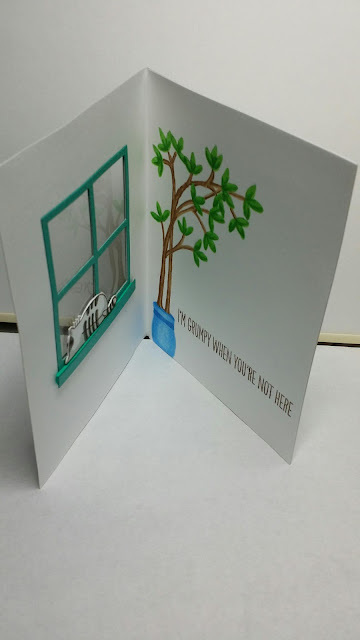 After putting the cat in the window I noticed it needed a little something so I drew a potted plant that was peeking into the window and colored it with my Copics. I stamped my sentiment on a piece of white cardstock that I cut using blueprint 16 and I adhered two yellow enamel dots. On the inside of my card I stamped the inside with I'm grumpy when you're not here.